Entrance hall with mirror and coat hooks. Shower room: with a contemporary walk-in shower, hand basin, heated towel rail and WC. There is a carpeted straight staircase with a hand rail (not steep) to the first floor living accommodation. A fabulous luxurious open plan living area with stunning uninterrupted views across the harbour. 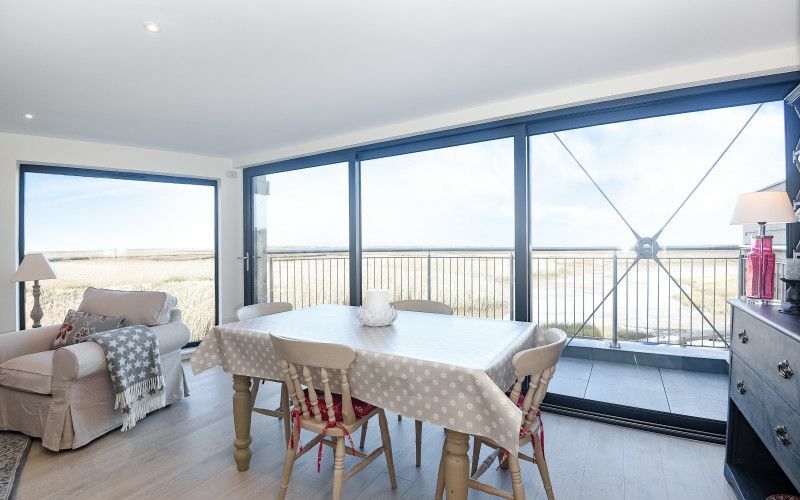 Includes a stunning kitchen, beautifully presented sitting area with a wood burner and lovely spacious dining area with glazed bifold doors leading out to a balcony overlooking the sea. Sail Away has a modern central heating system making it warm and comfortable throughout the year. There's the advantage of free Wifi provided. Kitchen area: stunning kitchen with a large island housing the sink and integral dishwasher. Around the island there are four comfortable bar chairs. The kitchen is extremely well-equipped with a double electric oven and integral hob with extractor hood, a full height integral fridge/freezer and a microwave. There is a great selection of cooking equipment, serving dishes, serving bowls and jugs. Dining area: Guests can sit around the large dining table and enjoy the lovely views - whatever the weather! When it's fine, the bifold doors open to reveal a large balcony. Sitting area: Beautifully presented with a central wood burner, comfy sofa, two armchairs, occasional tables and lamps, freeview digital TV with Blu-Ray DVD player . Bedroom 1: Lovely room with the bed carefully positioned to enjoy the spectacular sea views. Guests have the option of twin beds which be made up as a super king size bed with the use of a mattress topper.There are bedside tables and lamps, chest of drawers, coat hooks, a full length mirror and a rocking chair. Bedroom 2: Has a double bed, bedside tables and lamps, built-in wardrobe and a chest of drawers. Bathroom: A contemporary bathroom having a bath with fixed overhead drencher shower head and a second flexible shower head, heated towel rail, WC, hand basin. The roof terrace has outside furniture and provides the perfect space to relax and dine whilst enjoying the ultimate harbour views. It is surrounded by a solid railing and is secure for young children. Access to Sail Away is via an un-made road accessed via Harbour Way. There's the advantage of a shingled private parking area for two cars. The Norfolk coastal path is literally steps away with a lovely coastal walk in either direction: one way heads towards Brancaster and its glorious sandy beach, whilst the other way passes the sailing club and goes to Burnham Overy Staithe.